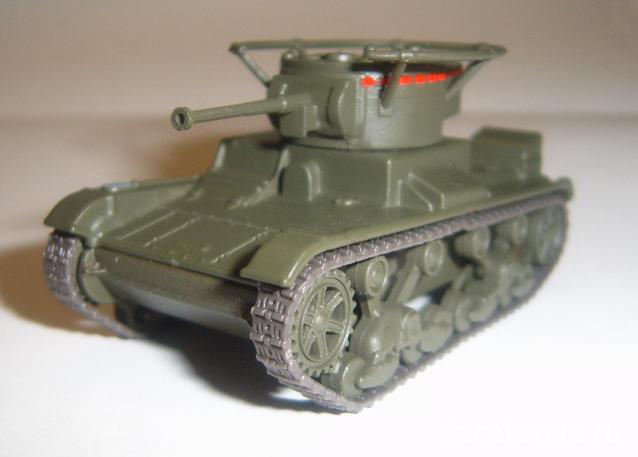 The T-26 tank was a Soviet light infantry tank used during many conflicts of the 1930s as well as during World War II. It was a development of the British Vickers 6-Ton tank and is widely considered one of the most successful tank designs of the 1930s. It was produced in greater numbers than any other tank of the period, with more than 11,000 produced. 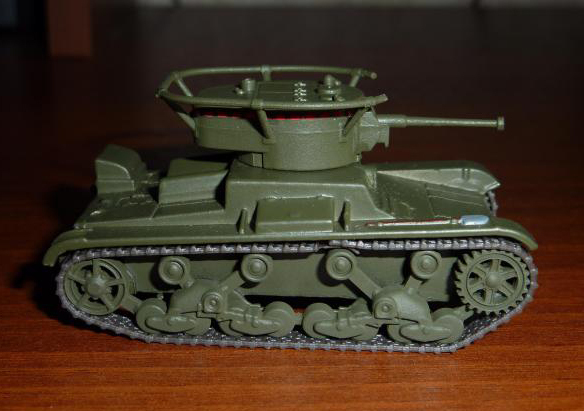 During the 1930s, the USSR developed approximately 53 variants of the T-26, including different combat vehicles based on its chassis (flame-throwing tanks, combat engineer vehicles, remotely controlled tanks, self-propelled guns, artillery tractors, armoured carriers). Twenty-three of these were series-produced, others were experimental models. 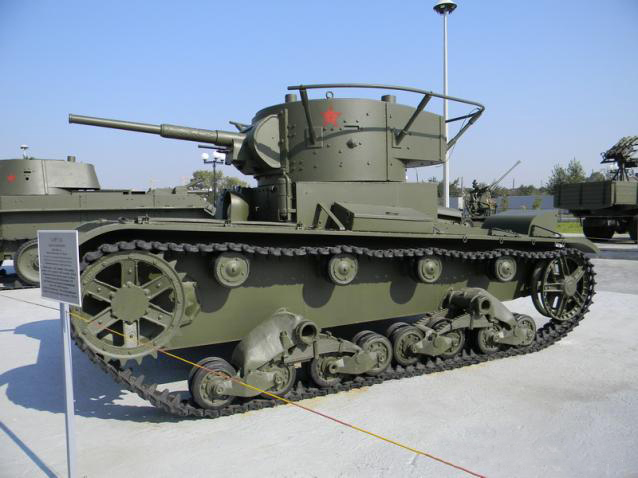 Though nearly obsolete by the beginning of World War II, the T-26 was the most important tank of the Spanish Civil War and played a significant role during the Battle of Lake Khasan in 1938 as well as in the Winter War in 1939-40. The T-26 was the most numerous tank in the Red Army's armored force during the German invasion of the Soviet Union in June 1941. 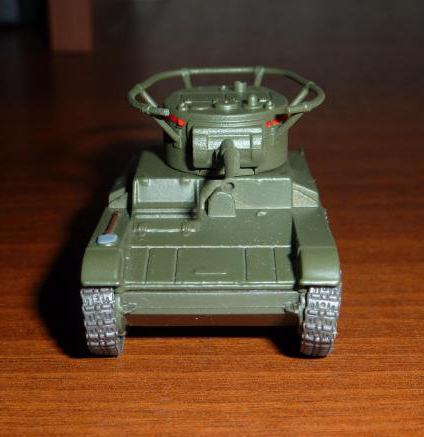 The Soviet T-26 light tanks last saw use in August 1945, during the Soviet invasion of Manchuria. 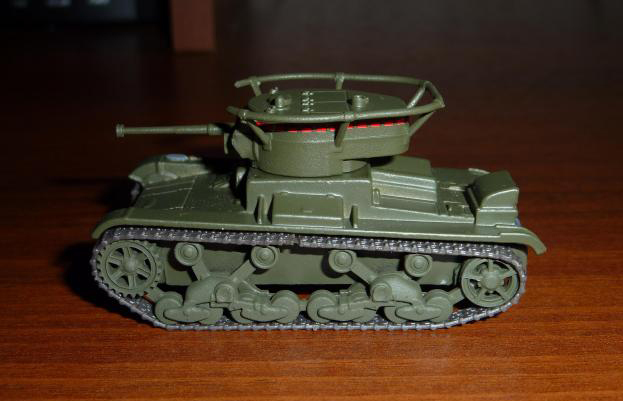 T-26 model 1933: single turret version armed with 45 mm 20K tank gun and DT tank machine gun. This version had a new cylindrical turret with a large rear niche. 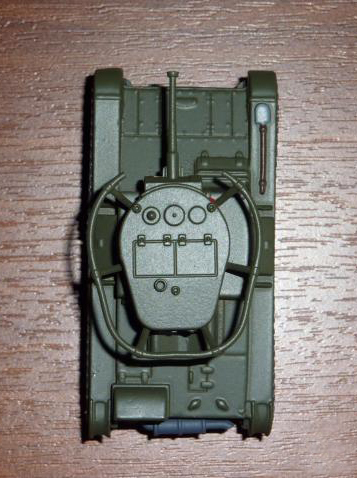 Some tanks were equipped with a 71-TK-1 radio station with a hand-rail antenna around the turret (so-called radio tanks). They were upgraded in 1935 with a welded hull and turret, and again in 1936 with a rear DT tank machine gun in the turret. 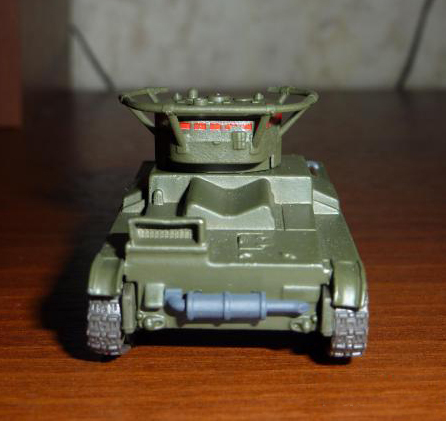 In 1937, some tanks were equipped with an anti-aircraft machine gun and a searchlight. The model 1933 was the most numerous variant.